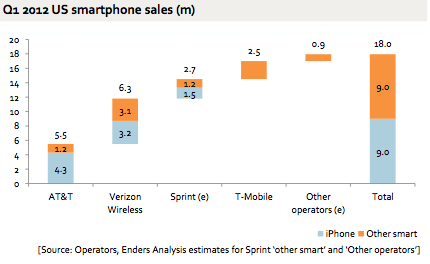 And yet globally, Android is outselling the iPhone 2:1. How to explain the discrepancy? In a word, price. 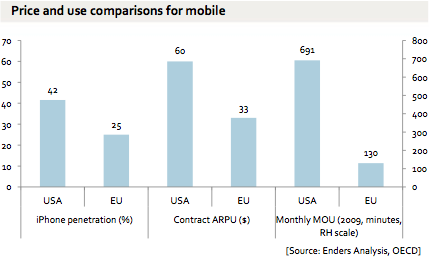 The full spread of smartphone offers in the US and UK is shown in the chart below. Hence, an American can only save 10% over two years by getting a ‘free’ smartphone over an iPhone. 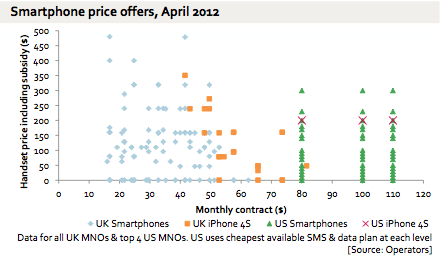 In the UK, the iPhone is 160% more expensive than the cheapest smartphone offer. July 2012 update: This was written before some US operators started offering the iPhone on prepay, which of course changes the TCO options. However, prepay is a (very) small niche in the USA, unlike elsewhere. The new shared data plans also affect the dynamic. 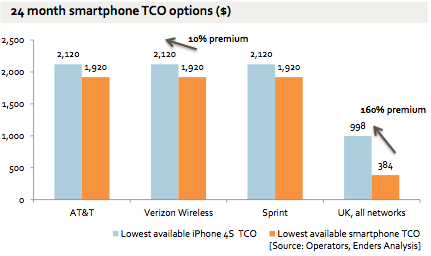 The underlying point remains: American spend substantially more on their monthly phone bills than people almost anywhere else, making the iPhone price premium much smaller as a percentage of the TCO.